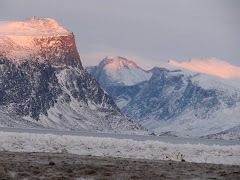 Pangnirtung Bound: It's here, it's here!! ...Got to love it--knew yesterday that this day was 'bound' to happen...(bc it was so darn cold!).. I'm just glad it's been 2 months since I've seen the stuff.. the last snowfall here in Pang was June 17/09... so that's like 2 months of goodness without the white stuff!! ...probably won't last...but you never do know!! you should come over tonight for a movie?...let me know.... dont' spend ALL your LONG weekend at work ok!? Call me! Perhaps the excitement for snow will disappear, but the excitement for FIRST snow...well that's just different.